Online, by Post or just in the High Street - if you see a Scammer or Fraudster or Con-man working hard to defraud people - often the most vulnerable - the elderly and financially naive - you need to let the rest of the world know. The Scamalot Scam Tip Off Report is the best way to publicize a scam that you've seen (anonymously, if you like) or a scammer that has tried to rip you off. Has Scamdex or Scamalot helped you? Consider making a donation so we can keep running. Advertizing revenue makes up a tiny amount of our expenses and we have bills to pay too. Support us with a one-off contribution. Scamdex sorts it's huge archive of Email Scams and Scam Tip-Off Reports into common types, including Lottery, Nigerian, Classified, Phishing, Dating, Jobs and Generic. Since 2004, our sister site, Scamdex has been collecting and classifying and publishing all the Scam Emails we have received. That's around One Hundred Thousand Emails! Take a look and see the kind of tricks these scumbag people use to part you from your money. Scamalot wishes to thank MaxMind for the use of it's GeoLite2 Geo-location database. We use it to investigate scams and scam reports and to limit comment spam. See more at http://www.maxmind.com. We also want to give a big Hand to the folks over at Akismet. We query and contribute to their database of 'bad' links/actors to help limit comment spam and junk contributions. More at https://akismet.com. Analysis of the Scam Tip Off reports shows that Classified Ads (Craigslist and other local websites) continues to tbe the major source of scam solicitations worldwide. 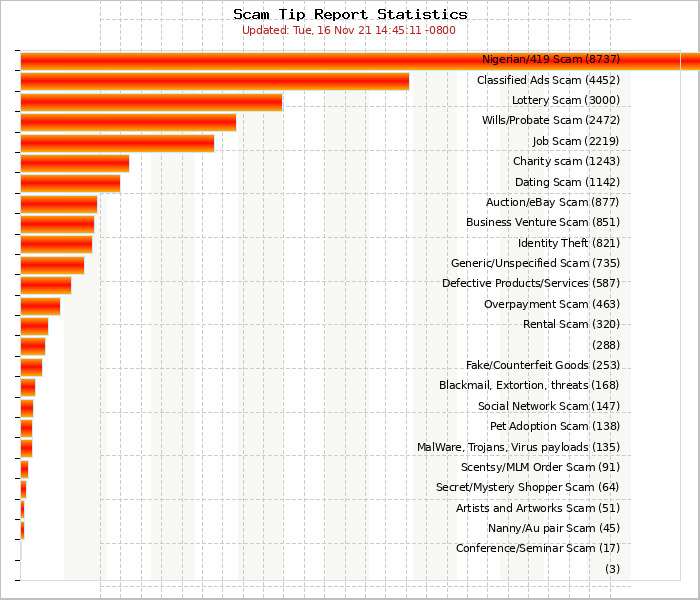 Spam promoted email scams make up the majority though, with the various Lottery and Nigerian-type scams. Job scams and Dating scams are still very common. Note that a lot of scams tend to be a mixture of these so clear classification is difficult. Scamalot relies on Search Engines, Social Media and plain old Word-of-Mouth to get it's message out. Check that your parents and other vulnerable family members are up to speed on online scams.